After a disappointing football game, it is time for some good whisky. 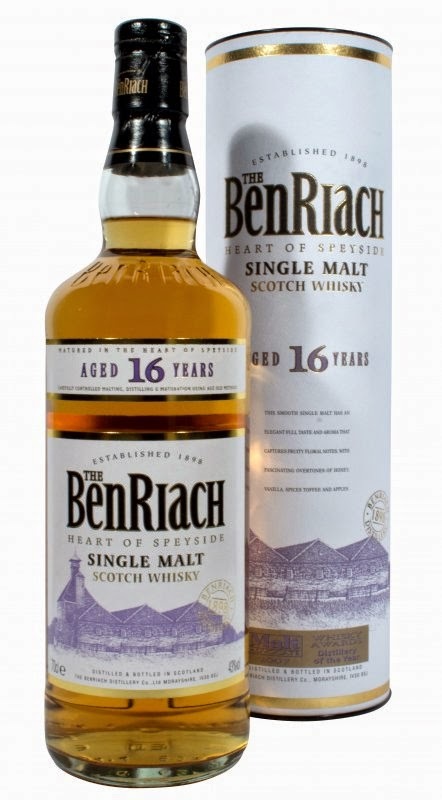 This time I have gotten the BenRiach 16 year old, so let’s take it for a spin! It is light with a hint of honey. Give it a minute and a mix of fresh and dried fruit hits your nose. Behind the fruits I get some gentle floral notes, but noting dominant. The taste is great! They made it 43 %, and it actually taste more like 46 %, so I’m all for that! Great power, with a relatively low percentage. Again fruit, mostly fresh, and lots of spice. In the finish, it is mostly the spices that are dominant. This whisky got a lot to offer. Complexity, balance and a lot of impressions, so if light-non-peated-whiskies is your choice, I would recommend this. The character for this is 85/100 (21/22/20/22).